A human skull and crossbones won't appear at a Christie's auction after another party claimed rights to the remains. World Archaeological Congress calls sale of human remains "affront to human dignity"
New York (CNN) -- A human skull and crossbones, valued at up to $20,000, won't appear at a Christie's auction Friday after another party claimed rights to the remains, the auction house announced. Yale University's secret Order of Skull and Bones used the skull and crossbones as a ballot box, Christie's said in its advertisement of the item in an auction catalogue. The auction house estimates the 19th century ballot box is worth between $10,000 and $20,000. The skull, crossbones and accompanying book of Skull and Bones members between 1832 and 1877 were "withdrawn from sale due to a title claim," Christie's said in a statement Friday. 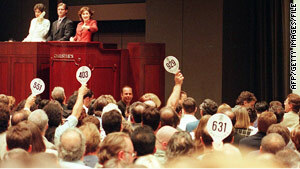 The global auctioneer did not say who claimed rights to the items. Earlier this month, the World Archaeological Congress condemned the sale, calling the sale of human body parts an "affront to human dignity." The group also suggested the skull might be that of a Native American and thus be subject to federal laws protecting Native American remains. This isn't the first time Skull and Bones has been entangled in a debate over human remains. The great-grandson of famed Chiricahua Apache warrior Geronimo sued Skull and Bones last year, claiming the society had Geronimo's remains. Historians disagreed on whether the society had ever dug up Geronimo's grave. The collegiate society has existed since 1832 and has prominent alumni such as former President George W. Bush and his grandfather, Sen. Prescott Bush.